Suad Thabet sits with her granddaughter Sandy at home in Abu Qarqas, Egypt. Thabet was attacked by a mob last year after one of her sons was accused of having an affair with a Muslim woman. Across a field from the unfinished concrete house where she lives, Suad Thabet can see the spires of the Abu Qarqas monastery. The 70-year-old Coptic Christian grandmother has had trouble sleeping since she was attacked in her nearby Egyptian village of Karm a year ago. She says living near the monastery makes her feel safe. 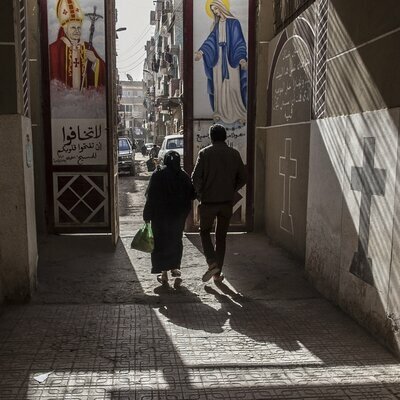 Since the toppling of former President Hosni Mubarak in 2011 and in the wake of a security vacuum that followed, there have been dozens of attacks on Egypt's Christians. Friday's attack on buses carrying Coptic Christians in Minya province, home to most of Egypt's estimated 9 million Christians, left at least 28 dead and was the latest in a recent string of assaults on this minority. Last month, suicide attacks at churches in two Egyptian cities killed 46 people attending Palm Sunday services. In February, murders claimed by ISIS militants forced many Christians to flee their North Sinai hometown. And in December, a suicide bombing left 29 dead at a church in Cairo. While not deadly, the attack last year on Thabet by Muslim villagers in Minyan province whom she had known for years stands out as one of the most shocking. It started with a rumor that her son, Ashraf Attiya, was involved with a married Muslim woman. Attiya is himself married and a father. On a Friday evening last May, "we were about to sit down to dinner, and then the house filled with people — each of them had a gun or a knife," Thabet tells NPR, as she sits on a wooden bench against a brick wall. She has a kindly smile, framed by a wrinkled face. In the tradition of village Christian women, she wears pants under a calf-length dress. Her hair is covered with a fraying knitted scarf. She says more than 40 people were in the mob. Some of them started shooting inside the house and beating her 79-year-old husband. "When I saw them hitting him, I screamed," she says. "Then they caught me and dragged me in the street and stripped me. I was standing naked in front of all those people." Attiya had left a few days earlier with his family, after villagers, angered by the rumor, threatened to kill him. Thabet says they dragged her other daughter-in-law, a teacher, from the second floor of the house and started beating her. Her terrified children hid behind a sofa. One of the men hit Thabet's son-in-law and stabbed her grandson in the shoulder. Then the mob poured gasoline inside the house and set it on fire. "They burned the house and everything in it," Thabet says. "They burned it. And we walked away — we were in shock." Thabet had gone to the police the night before to register a threat she had heard about burning Christian houses. She says they told her to go home. At first, she didn't want to file a complaint about the attack. A few days later, the regional prosecutor insisted that she tell him what happened. After being prevented from returning to her village, Thabet now lives near the Abu Qarqas monastery on the Nile Delta in Egypt's Minya province. Many of the country's Coptic Christians live in this province. The whole family ended up leaving the village. "We tried to go home, and they said, 'None of you can come back. Don't enter the village. It's not your village,' " she says. Like many in Egypt's countryside, Thabet can't read or write. Although she would have liked to go to school, girls in her village were kept at home. She says she has found the courage to tell her story because she wants justice. For two months after she filed her complaint, village leaders tried to persuade her to agree to local reconciliation — a process that bypasses courts and in which victims are often pressured to agree to a settlement. "We did not agree about reconciliation. We said we take our rights, then we reconcile," she says. Egypt's Coptic Christian Church has taken up Thabet's case. It sees the attack she suffered as a dangerous precedent that needs to be openly punished to prevent similar attacks. "Her case is the first time the church said 'no,' and it forced the state to take the legal route rather than the reconciliation," Bishop Makarios, the church's highest official in Minya province, tells NPR. "What happened is different than the murders and destroying the churches, shops and houses. It is different than the discrimination in jobs and universities," he says. "All of this we endure. But this humiliation? What is left if you strip a lady from her clothes?" Ashraf Attiya sits with his wife, Fifi, and daughter Sandy. 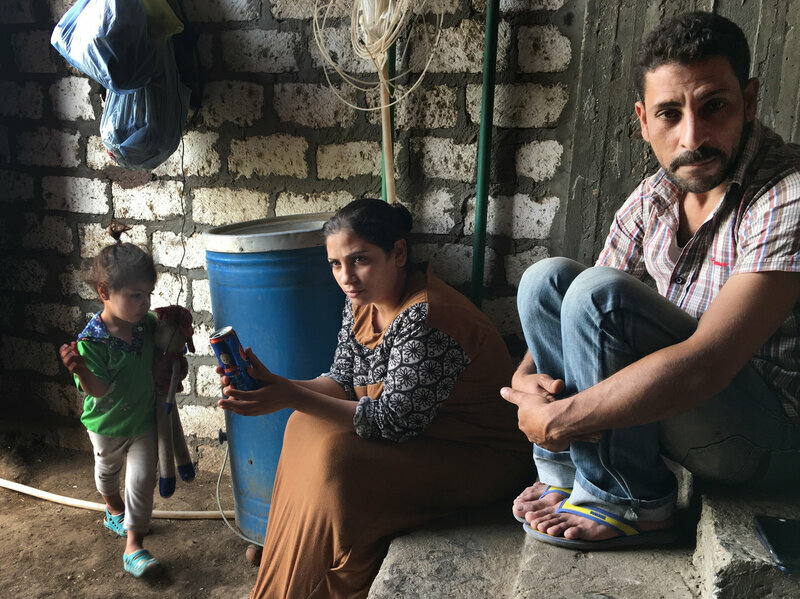 The Christian family was expelled from their village after Attiya was accused of being involved with a married Muslim woman. A mob stripped and dragged his mother through the streets and burned down their house. 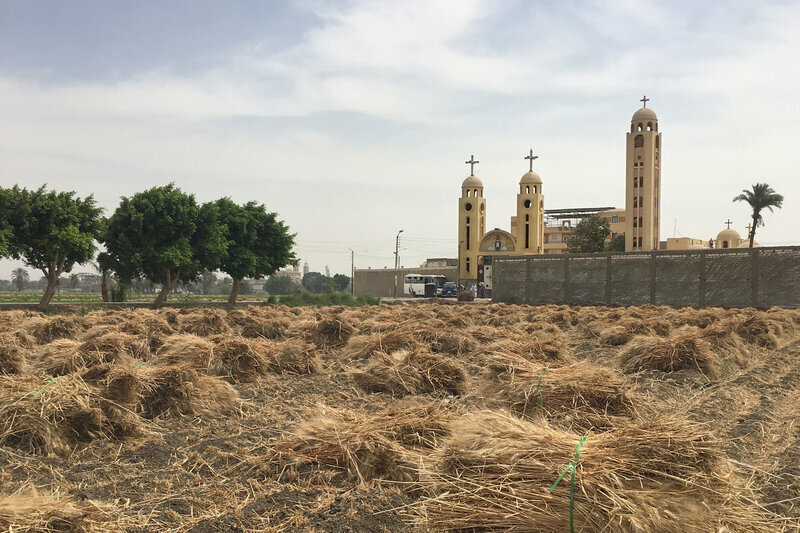 After centuries of persecution — starting with the Romans in the early days of Christianity — Egypt's Coptic Christians say their church has been built on the blood of martyrs. But in the country's conservative Arab society, dishonoring a woman — and, by extension, her family and entire community — is often seen as the ultimate insult. The case has been postponed twice for lack of evidence, most recently in January. Makarios says he expects it be reopened soon. The attack was so shocking that President Abdel-Fattah el-Sissi — who enjoys support from many Egyptian Christians — ordered the army to rebuild Thabet's burned-down house. Thabet says it has been rebuilt, but it is an empty shell. She says her family was left with no money to replace furniture or anything else. To put food on the table in the village where they are staying, her husband, now 80, has resorted to working as a field laborer for less than $2 a day. 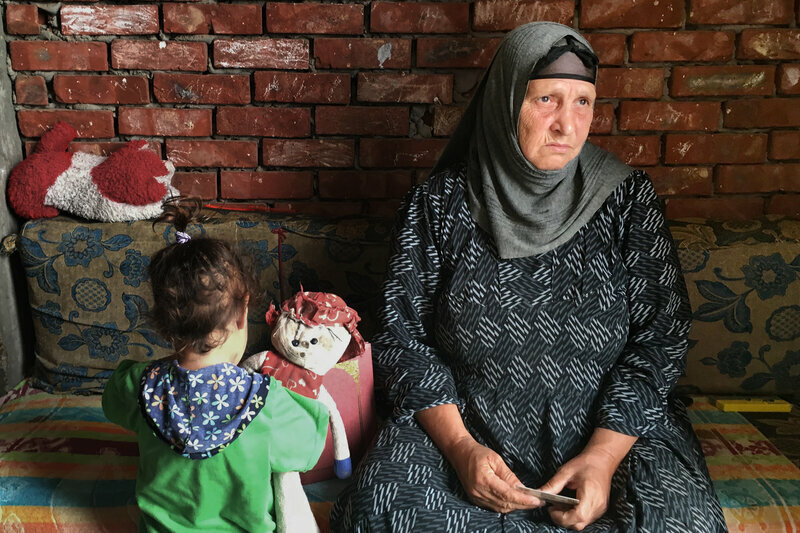 Thabet says her son Attiya can't leave the house to work because townspeople have threatened to kill him. She says worse than the attack itself is that it has separated her family. Her elder son, a teacher, moved to Cairo with his wife and daughter after the attack. "We can't go back to the village," she says. "They are threatening [Attiya] and threatening us. They say none of you can go back." Of roughly 50 Christian families living in Karm, Attiya says more than half moved away after the attack. "Our village, Karm, does not have a lot of Christians. So [Muslims] come from other villages and do and say what they want to Christians there because we are poor and simple — and they know even if they curse us or hit us, we will keep quiet," he says. His mother says despite the attack, she still wants to go back to her house — after she gets justice. "Whenever we try to go home, they threaten us," she says. "I am a Coptic woman and an Egyptian citizen."